I calculated my mortgage debt, subtracted my tiny home value, added my student loan debt and my auto loan debt, and then subtracted my liquid cash. The total? An astonishingly huge negative number representing my net worth. Not wanting to stop at the large, large, large negative number, I added the amount in our retirement accounts (though technically locked up for the next 27 years under mounds of government and ESOP paperwork). I landed at a number closer to zero but still negative none the less. PLEASE EXPLAIN WHY YOUR TOTAL NET WORTH IS A NEGATIVE NUMBER. Yes, they wrote it in all caps. As if I needed a reminder that I’ve made some pretty large financial snafus. Little do they know that if my number landed anywhere close to zero, they’d find me dancing excitedly like a lunatic on top of the bus I take every day. Certainly I can’t be the only one with an insanely underwater mortgage that throws off my net worth right? Let’s do a poll. Is your net worth a positive or negative number? And if you see 14 comments after I post this that say ‘positive’ and you’re about to say ‘positive’ as well, say ‘negative’ just to make me feel better. Negative. My wife and I owe about $470K with assets of $338K. Student Loans account for $225K of our debt. By the way, student loans are evil. They are non-dischargeable in bankruptcy and once you consolidate (like we did) you are stuck with your loan forever. 8% interest adds up pretty fast on that much debt and in a recession, incomes don’t grow to match. 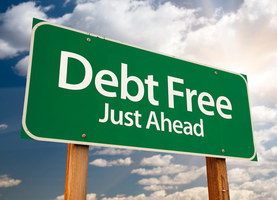 Our lifelong goal is to be debt free when we die. Way Negative, currently -$94,000. I went to school for my PhD in science. During this tenure, dw and I had our first child, and my wife decided to stay home. Thus, lots of student debt and about $20K in cc debt. We are both 27. Thanks to a great job, we plan to pay off cc’s in one years time. And with awesome 401(k) contributions from my employer. So our picture will improve quickly. Uh oh, very simple. NEGATIVE of course. No car, no assets otherwise. Total negative -$36.500… Which is over my yearly income of $33.250. Adding to the mix I have $0 in savings or retirement , and I’m 32yrs old. My mortgage and my house value are nearly equal, same with car value and auto debt, very little assets otherwise. My wife and I together owe $100,000 on our school loans. We have $30,000 in the bank and $10,000 in retirement funds. So, we are $60,000 in the hole (I don’t count our cars, as they are depreciating assets). We don’t own property. We are in our late 30s and both work full time. Yes, I’m scared!